Turn on the TV or browse the Internet and you will find many indications pointing to the fulfillment of end-time prophecy, whether in the continued conflicts in the Middle East, the economic woes of the United States and Europe or the decline of morality in general. Yahshua in His parable of the fig tree explained how these signs will precede His coming. “Now learn a parable of the fig tree; When his branch is yet tender, and putteth forth leaves, you know that summer is nigh. So likewise you, when you shall see all these things, know that it is near, even at the doors” (Matt 24:32-33). As nature reveals the coming of the seasons, Yahshua states that prophecy reveals the timing of His return. Two specific forewarnings of the tribulation are found in the Olivet Prophecy and the vision of the Four Horsemen. These mirror and detail each another and foretell the events of the first three-and-a-half years of a seven-year covenant that the Antimessiah, commonly called the Antichrist, will establish (Dan. 7:29). The first sign that stands out in both the Olivet Prophecy and the Four Horsemen narrative is deception. Yahshua in His Olivet Prophecy states, “…Take heed that no man deceive you. For many shall come in my name, saying, I am Messiah; and shall deceive many…For there shall arise false Messiahs, and false prophets, and shall shew great signs and wonders; insomuch that, if it were possible, they shall deceive the very elect,” Matthew 24:4-5, 24. During this time there will be deception as never before. Many false prophets and false messiahs will surface and do astounding things. The word for “signs” is derived from the Greek semeion and refers to a miracle. Many will witness these great wonders and believe in the authenticity and power of these false men. Their signs will be so remarkable that even the most sincere may be deceived. Yahshua put it this way: “…if it were possible, they shall deceive the very elect,” Matthew 24:24. Because of these dangers, this time will require complete faith in and devotion to the One we worship. If we are deceived by a false prophet or false messiah we will forfeit our eternal salvation. “And the third angel followed them, saying with a loud voice, If any man worship the beast and his image, and receive his mark in his forehead, or in his hand, the same shall drink of the wine of the wrath of Elohim, which is poured out without mixture into the cup of his indignation; and he shall be tormented with fire and brimstone in the presence of the holy angels, and in the presence of the Lamb: And the smoke of their torment ascendeth up for ever and ever: and they have no rest day nor night, who worship the beast and his image, and whosoever receiveth the mark of his name,” Revelation 14:9-11. Those who forsake Yahweh for the worship of the Beast or Antimessiah will pay with their eternal life. Scripture warns that they will drink of the wine of the wrath of Elohim. Our Father will destroy the Antimessiah and those who follow him. This includes those who receive the mark of the Beast on their right hand or forehead. How will we avoid such deception? We must know the signs that our Savior gave in the Olivet prophecy and to John of Patmos in the book of Revelation. These serve as a roadmap of that which we’re to avoid as believers. As the end becomes closer these threats become more real and dangerous! In fact, the Apostle Paul prophesied of a great falling away that would precede the revealing of the Man of the Sin. He wrote, “Now we beseech you, brethren, by the coming of our Master Yahshua Messiah, and by our gathering together unto him, that you be not soon shaken in mind, or be troubled, neither by spirit, nor by word, nor by letter as from us, as that the day of Messiah is at hand. Let no man deceive you by any means: for that day shall not come, except there come a falling away first, and that man of sin be revealed the son of perdition,” 2Thessalonians 2:1-3. This same admonition is as relevant to us as it was to the people of Thessalonica. We are not to be soon shaken. In other words, we must hold firm to the promise and truth of Scripture. This is why it’s critical that we as believers prove all things, as Paul instructs in 1Thessalonians 5:21. An intense desire to learn the truth characterized the Bereans, “And the brethren immediately sent away Paul and Silas by night unto Berea: who coming thither went into the synagogue of the Jews. These were more noble than those in Thessalonica, in that they received the word with all readiness of mind, and searched the scriptures daily, whether those things were so,” Acts 17:10-11. The consequence of not proving all things can lead to deception and even defection from the truth. Paul prophesied of a great falling away that would occur before the exposing of the Man of Sin. Will we be one of the deceived or one of the elect who was not quickly shaken in faith? 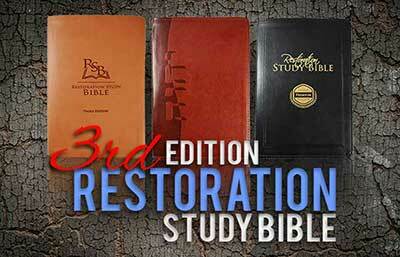 The answer lies in our willingness to study and prove what we believe from our Father’s Word. If we simply coast through life without confirming our core beliefs, then what makes us think that we will have the spiritual stamina and strength to hold firm to the end? If we are unsure why we believe as we do, that belief can be quickly snatched away by deception and error. The life of a believer requires action and this was the message of our Savior in His Olivet Prophecy. This is why He again warned first about deception. He knew that this would be the most destructive. Obeying the commandments and holding to the faith of Yahshua the Messiah, our Savior, will strengthen our resolve and dedication. Any man claiming to be a prophet and trying to persuade that Yahshua is not the Messiah is to be avoided. Now we might think that we could never be deceived by a man claiming to be a prophet or the Messiah. Then why did Yahshua say that false prophets and false messiahs would show great signs and wonders and if possible, deceive the very elect of Yahweh? For this reason, it is incumbent to put on the whole armor of Yahweh: “Wherefore take unto you the whole armour of Elohim, that you may be able to withstand in the evil day, and having done all, to stand. Stand therefore, having your loins girt about with truth, and having on the breastplate of righteousness; And your feet shod with the preparation of the good news of peace; Above all, taking the shield of faith, wherewith you shall be able to quench all the fiery darts of the wicked. And take the helmet of salvation, and the sword of the Spirit, which is the word of Elohim,” Ephesians 6:16. Notice that Paul defines the sword of the Spirit as Yahweh’s Word. The greatest defense against deception will be the knowledge of the truth found in the Scriptures. Without it, we will have no way of knowing whether something is true or false. It is for this reason that we must study and prove all things. This doesn’t only apply to prophecy, but to all aspects of our worship. While similarities exist between Yahshua and the first horseman, there are also significant differences. First, the timing of these passages is different. While the first horseman appears at the beginning of the seven-year tribulation, Yahshua arrives at the end. Second, Yahshua has a different weapon. Unlike the first horseman holding a bow but no arrows, Yahshua holds a sharp sword. For these reasons, a far more likely interpretation for the first beast is the Antimessiah and his campaign of deception. Another reason for this view is the parallel between Yahshua’s Olivet Prophecy and the four horsemen. As Yahshua began His prophecy in Matthew 24 with a warning against deception through false messiahs and false prophets, we find here the same message. There is one last parallel to consider. While both Yahshua and the beast wear a crown, the crown of the beast indicates kingship through Satan the devil. The Antimessiah will go forth conquering (Dan. 7:25; Rev. 13:4) and will rule this earth as the ultimate despot (2Thess. 2:4; Rev. 17:12-13). Along with deception, Yahshua also warns against coming conflict. “And you shall hear of wars and rumours of wars: see that you be not troubled: for all these things must come to pass, but the end is not yet. For nation shall rise against nation, and kingdom against kingdom” (Matt. 24:6-7a). As we near the end we will see an increase in war. The Messiah verified that nation would be against nation and kingdom against kingdom. The word “nation” comes from the Greek ethnos and means a race or tribe, referring to tribal conflict and civil wars. Since 1550, over 100 civil wars have been fought around the world. At present, we see such conflicts in Colombia, Afghanistan, Uganda, Somali, Yemen, Chad, Iraq, Egypt, Libya, and Syria. Yahshua also said that kingdom would be against kingdom. This word is from the Greek basileia and means, “royalty, i.e. (abstractly) rule, or (concretely) a realm (literally or figuratively)” (Strong’s). The word “kingdom” then refers to sovereign nations. Are we seeing wars between nations today? Absolutely! As of early 2013, news of continued conflict was reported in the Middle East, including Afghanistan, where forces of the United States, Europe, and Australia were still fighting insurgents. Beyond Iran there is also the un-predictable North Korea. Kim Jong-un, the supreme leader of North Korea, has followed in the footsteps of his father, Kim Jong-il. Instead of pursuing peace with South Korea and its neighbors, he continues to take provocative steps that only amplify the current concerns of the international community. In a recent move, Kim Jong-un has threatened nuclear war with the United States. While some experts believe that their nuclear arsenal is not ready for such a bold move, the threat remains and will inevitably grow. As our Savior prophesied, we continue to hear of threats of conflict. Instead of arrows and spears, however, it’s now nuclear war, which has the potential of wiping out hundreds of thousands, if not millions! Prophecies show that this time will be especially dangerous for those who follow Almighty Yahweh. The first Beast of Revelation 13, the Antimessiah, will murder some of the saints. He will do this in a time of transition for a space of three-and-a-half-years, as confirmed in Daniel’s prophecy. It will require incredible spiritual stamina to hold firm to the end. Martyrdom is also seen in the fifth seal of Revelation, “And when he had opened the fifth seal, I saw under the altar the souls of them that were slain for the word of Elohim, and for the testimony which they held: And they cried with a loud voice, saying, How long, O Yahweh, holy and true, dost thou not judge and avenge our blood on them that dwell on the earth? And white robes were given unto every one of them; and it was said unto them, that they should rest yet for a little season, until their fellowservants also and their brethren, that should be killed as they were, should be fulfilled,” 6:9-11. Some will be called to sacrifice their lives as witnesses or a testimony to their faith. If that is our destiny will we have the boldness to remain faithful? Those who do will be given white robes. The white robes represent the salvation of the saints. Those who faithfully serve Almighty Yahweh unto death will be assured eternal life. Yahshua said, “For whosoever will save his life shall lose it: but whosoever will lose his life for my sake, the same shall save it,” Luke 9:24. Even though some of the elect will be martyred, death is not certain for all. Scripture states that many of the faithful of the Father, symbolized by a woman, will be protected in the wilderness: “And to the woman were given two wings of a great eagle, that she might fly into the wilderness, into her place, where she is nourished for a time, and times, and half a time, from the face of the serpent,” Revelation 12:14. The wilderness symbolizes a place of refuge on earth for the last three-and-a-half-years of the Great Tribulation. Here, the elect will find safety and provision (nourished). This word comes from the Greek trepho and means, “to stiffen, i.e. fatten (by implication, to cherish (with food, etc. ), pamper, rear)” (Strong’s). During this time, Yahweh promises that He will feed His assembly in the wilderness, as He did for Israel in the Old Testament during a similar time of escape. This will likely be done with manna, as the risen Messiah prophesied to the Pergamos assembly, “He that hath an ear, let him hear what the Spirit saith unto the assemblies; To him that overcometh will I give to eat of the hidden manna, and will give him a white stone, and in the stone a new name written, which no man knoweth saving he that receiveth it,” Revelation 2:12. The word “chamber” is the Hebrew cheder and also means, “a room, parlor, an innermost (or inward) part, within” (Brown Driver & Briggs Hebrew Lexicon). This “chamber” or room represents a place of refuge for Yahweh’s elect. The day of Yahweh’s anger here is a reference to the Great Tribulation. Although He will hide His people during this time, it is not a rapture. The Bible indicates that this protection will be a place on earth, in the same way He protected His people in the Old Testament. We also see that there is a prerequisite for those found worthy of this protection. The prophet says to seek righteousness and meekness. The word righteousness derives from the Hebrew tsadaq and refers to doing what is right or just. Paul states, “Wherefore the law is holy, and the commandment holy, and just, and good,” Romans 7:12. In addition to obeying our Father’s Word, Zephaniah says that we are to be meek and humble. Yahweh will reject all who are proud. This second horseman rides a red horse, likely symbolizing the blood of war. According to Strong’s, the word “power” is not found in the ancient text; however, based on the context this can be assumed. This horseman is given authority to cause death through the act of war, which is symbolized by the great sword. As we also found in the Olivet Prophecy, before Yahshua’s Second Coming this earth will suffer horrific conflict. It will begin in the first three-and-a-half years of the Tribulation, also known as Jacob’s trouble (Jer. 30:7). The Antimessiah will likely leverage these global wars to bring peace (Jer. 6:14) and unite all nations under him for the last three-and-a-half years of the Great Tribulation. Yahweh’s Word speaks of one last battle, which will occur at the end of this age. Many call it Armageddon. While this word appears in Revelation 16:16, it does not describe the place of the last battle. Instead, Armageddon is a staging location in southwest Jezreel (“El sows”) Valley on the plains of Esdraelon where the armies of the world will gather before the age-ending battle of the ages. For those who come against this holy city, Yahweh will make it a burdensome stone. As prophesied by Zechariah, He will defend and aid the people of Judah and Benjamin: “In that day, saith Yahweh, I will smite every horse with astonishment, and his rider with madness: and I will open mine eyes upon the house of Judah, and will smite every horse of the people with blindness. And the governors of Judah shall say in their heart, The inhabitants of Jerusalem shall be my strength in Yahweh of hosts their Elohim. In that day will I make the governors of Judah like an hearth of fire among the wood, and like a torch of fire in a sheaf; and they shall devour all the people round about, on the right hand and on the left: and Jerusalem shall be inhabited again in her own place, even in Jerusalem. Yahweh also shall save the tents of Judah first, that the glory of the house of David and the glory of the inhabitants of Jerusalem do not magnify themselves against Judah. In that day shall Yahweh defend the inhabitants of Jerusalem; and he that is feeble among them at that day shall be as David; and the house of David shall be as Elohim, as the angel of Yahweh before them,” 12:4-8. Those who attack Jerusalem will be stricken to the very core of their being. Yahweh will smite every horse with astonishment and rider with madness. The word “astonishment” is from the Hebrew timmahown and refers to a “bewilderment or confusion.” Horses, which are still used in modern warfare, especially in the Mideast, will become confused or disoriented when they come against Yahweh’s Holy Spirit. The riders will be rendered insane. If this were not enough, Yahweh will empower and strengthen His people. The governors will be like a hearth of fire among the wood, consuming those who oppose them. Even the most feeble or weak will become strong like David the warrior. Possibly the greatest revelation here is that those of the house of David shall be as Elohim. There is only one other place where man is given such a position. In Exodus 4:16, Yahweh promises Moses that He would be to the people as Elohim. There is not an army in the world now or in the future that will be able to defeat Yahweh and those He empowers through the strength of His Spirit. Widespread famine is in both the Olivet and the Four Horsemen prophecies. In Matthew 24:7 Yahshua prophesied, “…and there shall be famines…” Before the Great Tribulation occurs, there will be a shortage in foodstuffs in part because of war. Famine is devastating wherever it occurs, and historically has been most difficult in the Middle East. Egypt was hit particularly hard both in the days of Joseph and in 1064-71 CE, both famines lasting seven years. When human beings are under a prolonged famine, they will do about anything to survive, even to the point of what McClintock and Strong call “indescribable enormities”: “Parents consumed their children; human flesh was, in fact, a very common article of food” (Cyclopedia of Biblical, Theological, and Ecclesiastical Literature, vol. 3, p.480). Now notice verse 10 and the consequences of this severe famine: “Therefore the fathers shall eat the sons in the midst of thee, and the sons shall eat their fathers; and I will execute judgments in thee, and the whole remnant of thee will I scatter into all the winds.” Along with what Yahweh calls “the evil arrows of famine,” He promises even an increased famine severity, evil beasts, pestilence, and war, vv. 16-17. As we approach our Savior’s Coming, famine will become more common, directly related to an increase in war and other plagues. Can you imagine a day when you are unable to provide food for your spouse and children? Even though hard to contemplate in this nation of plenty, the future possibility isn’t only probable but prophesied. In the 1930s this nation underwent the Great Depression. Prior to the Crash was a time of great prosperity. It was unthinkable that such an economic calamity was imminent. But with the fall of the stock market in 1929, the unimaginable became real. Mothers were unable to provide for their families, fathers were unable to find work and food was either nonexistent or so expensive it was nearly out of reach for most families, and especially for those who did not farm. These are just two accounts from the millions who suffered during the Great Depression. It was a blessing to simply have food for your family during those difficult days. Those old enough to remember this time still tremble at the thought of these challenges. Could a time such as this one occur again? In 1929 America was not $16 trillion in debt, and facing over $100 trillion in unfunded liabilities. That’s over $360,000 in debt per citizen. In 1929 most states were not bankrupt, insolvent and dependent on federal government handouts to survive…. In 1929 we did not have 21 million government employees with bloated salaries, huge pensions, and free health care for life. Today 1 out of 5 federal employees earns over $100,000. Today, 77,000 federal employees earn more than the governors of their states. Staggering numbers of federal government employees retire at a young age with $100,000 pensions for life. Unfortunately on the state and local levels it’s even worse. There is now nearly $4 trillion in unfunded pension liabilities for state government employees. Protected by their unions and the politicians they elect, government employees are bankrupting America. In Illinois there are retired government employees making over $425,000 per year. With all these uncertainties, this nation and much of the world are teetering on crises. If this day ever arrives, such a disaster would usher in famine and other prophetic signs that our Savior predicted would come to pass before His coming. The plague of famine is also seen in the third horseman of Revelation 6: “And when he had opened the third seal, I heard the third beast say, Come and see. And I beheld, and lo a black horse; and he that sat on him had a pair of balances in his hand. And I heard a voice in the midst of the four beasts say, A measure of wheat for a penny, and three measures of barley for a penny; and see thou hurt not the oil and the wine” (vv. 5-6). “Balances” is key here. According to Barnes’ Notes, “This word properly means a yoke, serving to couple anything together, as a yoke for cattle. Hence it is used to denote the beam of a balance, or of a pair of scales—and is evidently so used here.” These balances indicate the shortage and scarcity of food. The word “penny” refers to the denarius, a Roman coin that was worth about one day’s wages. A quart of wheat or three quarts of barley is considered the rations for one man, specifically a soldier. The prophesied famine will be so severe that it will require an entire day’s wage to purchase the rations for one man. Where will this leave millions of families with children and those tending to the needs of others? It is not hard to envision a population that will do just about anything to obtain for themselves whatever food is available. Now, why is this horseman told not to hurt the oil and wine? This passage has led to several interpretations. Some scholars point out that these represent discretionary items typically reserved for the rich and will be abundant. Key food staples like wheat, corn and barley, on the other hand, will be extremely scarce. The last plague is death from pestilence. In Luke 21:11, a parallel to Matthew 24, Yahshua prophesied, “…and pestilences; and fearful sights and great signs shall there be from heaven.” The word “pestilence” comes from the Greek loimos and means a plague or disease. Before Yahshua’s coming, diseases will increase. Some of the most common diseases today include: cancer, heart disease, stroke, and diabetes. In addition to these, there are several more ominous maladies such as the bird flu and mad cow disease. Homosexuality and drug use are diametrically opposed to Yahweh’s Word; homosexuality being called an abomination (Lev. 18:22; Rom. 1:27; 1Cor. 6:9). Is this simply a coincidence or a curse for not following our Father in heaven? Ironically, we find that those who worship the Beast’s image will also suffer from a horrific plague, “And the first went, and poured out his vial upon the earth; and there fell a noisome and grievous sore upon the men which had the mark of the beast, and upon them which worshipped his image,” Revelation 16:2. The word “sore” is derived from the Greek helkos and refers to an ulcer or to an open wound. We also find a similar curse in the Old Testament: “But it shall come to pass, if thou wilt not hearken unto the voice of Yahweh thy Elohim, to observe to do all his commandments and his statutes which I command thee this day; that all these curses shall come upon thee, and overtake thee…Yahweh will smite thee with the botch of Egypt, and with the emerods, and with the scab, and with the itch, whereof thou canst not be healed,” Deuteronomy 28:15, 27. The parallel account to this sign is found in the final of the four horsemen. “And when he had opened the fourth seal, I heard the voice of the fourth beast say, Come and see. And I looked, and behold a pale horse: and his name that sat on him was Death, and Hades followed with him. And power was given unto them over the fourth part of the earth, to kill with sword, and with hunger, and with death, and with the beasts of the earth” (Rev 6:7-8). The word “pale” is from the Greek chloros and means, “greenish” (Strong’s). Some scholars attribute this pale-greenish color to sickness and disease. The rider on the horse is called Death, being derived from this Greek hades, symbolizing its purpose. The word “hades” simply refers to the grave. In addition to representing pestilence, the fourth horseman likely represents the cumulative death that will befall mankind during the Tribulation. He is given power to bring death by sword, by famine and by disease. In essence, he is the cumulative impact of the previous three. As Israel had to endure the first four plagues of Egypt, it appears that the saints will suffer from these Four Horsemen. 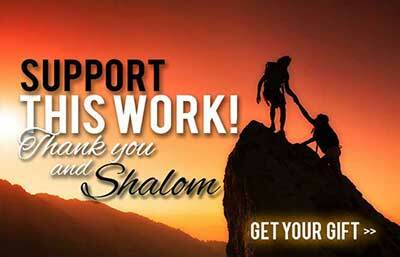 Consequently, it is imperative that His people remain strong in Almighty Yahweh and Yahshua the Messiah. We must place our trust in the One we worship. If we falter in faith, we may lose the very hope that we treasure. Even though this was written historically to the assembly in Smyrna, the message is also prophetic for the last days. Yahshua says here to not fear death. Those who overcome and are faithful to death will receive a crown of life. There is not a greater promise in Yahweh’s Word. No matter what we may suffer in this life, it is inconsequential when compared to the promise of Yahweh’s Kingdom. As believers what must we do to be saved? We must obey the commandments and have faith in Yahshua the Messiah. We find this in several passages in the book of Revelation: “And the dragon was wroth with the woman, and went to make war with the remnant of her seed, which keep the commandments of Yahweh, and have the testimony of Yahshua Messiah,” 12:17. “Here is the patience of the saints: here are they that keep the commandments of Yahweh, and the faith of Yahshua,” 14:12. “Blessed are they that do his commandments, that they may have right to the tree of life, and may enter in through the gates into the city,” 22:14. From these three key passages we find that we must obey our Father in heaven and believe or have faith in the testimony of Yahshua the Messiah. They go hand-in-hand and are not mutually exclusive. Contrary to popular belief, obedience and faith are not at odds with each other. James explains that faith and obedience work in concert. “Even so faith, if it hath not works, is dead, being alone. Yea, a man may say, Thou hast faith, and I have works: shew me thy faith without thy works, and I will shew thee my faith by my works,” James 2:17-18. We show our faith by our life actions, including obedience to our Father in heaven. Those who obey the commandments and have faith in Yahshua the Messiah will be tested as never before. For this reason it’s incumbent that we stand strong and hold firm unto the end! Those who do will be blessed immeasurably. As Yahshua prophesied in His Olivet Prophecy, “And there shall be signs in the sun, and in the moon, and in the stars; and upon the earth distress of nations, with perplexity; the sea and the waves roaring; Men’s hearts failing them for fear, and for looking after those things which are coming on the earth: for the powers of heaven shall be shaken. And then shall they see the Son of man coming in a cloud with power and great glory,” Luke 21:25-27. Even though the Great Tribulation will bring unparalleled deception, war, famine, and disease, for the faithful the end will be one of great blessings. As Yahshua with His angels descend from heaven, those who stand firm unto the end will look up and see their redemption or salvation drawing near. At this time, those who died in Messiah will arise and those alive will be caught up together with them to meet Yahshua the Messiah in the clouds as He descends to the earth, 1Thessalonians 4:16-17. If you yearn for the blessings of our Father in heaven and Savior, then the time is now for us to fully dedicate our lives to them. Salvation comes not through passiveness, but through an earnest desire to wholly commit our lives to Almighty Yahweh and our Savior, Yahshua the Messiah! 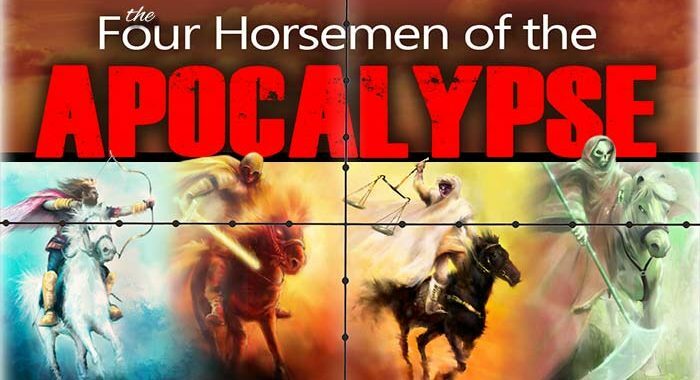 The Four Horsemen of the Apocalypse booklet watch and request! Please take a moment to complete our short survey. We appreciate your time and value your feedback. Posted in End-time Prophecy, Booklets.